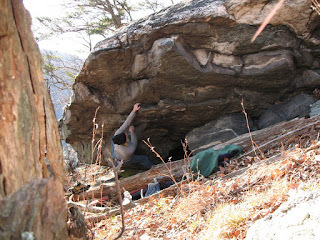 Check out the 4 new photos on the Skink Rock page. Thanks Jeff, Maggie, Craig for sending in your pics! Changed the loudon heights photo so the labels stay overlapped in place. May have new pics of Skink Rock soon. 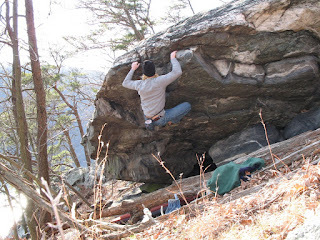 Three climbers went this weekend to Skink Rock and may have pics available soon. Thanks Jeff, Maggie, and Craig. 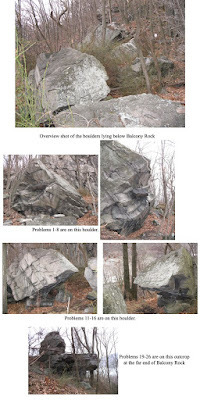 The Loudon Heights photo with labels is not cooperating and the labels are shifting so that they are not over the location of the climbing areas in the picture but otherwise it's running. Added the biggest secret bit of bouldering at Harpers. The Underground Railroad overhang. 25 ft of the steep. Edited the index page to add caution statement, the access fund, Indy's page, Rob Savoye guide, and the HFNHP website. Added more areas to the climbing index page. A local crew is headed to check out lines on Balcony Jr, get photos, and do new lines. 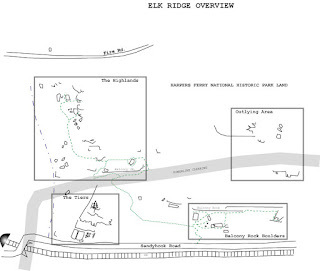 Here is a map for the Highlands to help navigate. I'll get a page up sometime with the maps, problem info, etc.. for the highlands but for now this should help! Updated Balcony Jr and added some info on the Outlying area including both rope and bouldering on the same page. Updated the site today. 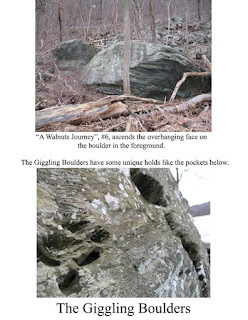 Below are year old winter photos of the Starlight Boulder. I'm 6'3" and make this boulder look smaller than it is for most people. Enjoy. If you're reading this and watching the vids you should know that it is ILLEGAL to be on those tracks and on top of the tunnel. That is not Harpers Ferry National Historic Park Lands and you can be arrested for trespassing. Prooceeeeeeeeed at your own risk! 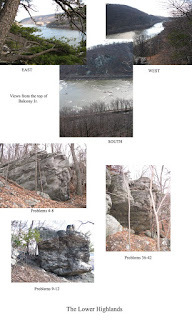 Will try to post the entry page for http://www.harpersferryclimbing.com/ soon. Enjoy the eye candy update! I forgot the starlight boulder layout image the other day! Photo composites of many areas! That ought to do for now. 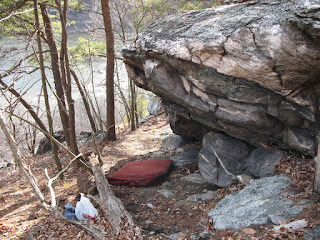 It's official http://www.harpersferryclimbing.com/ is mine! 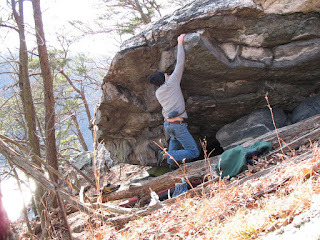 I will slowly begin the reinstallment of the bouldering guide and eventually chip away at the rope climbing guide! Enjoy the old photo composite from Harpers that is above. Click on it to see it at a larger size! 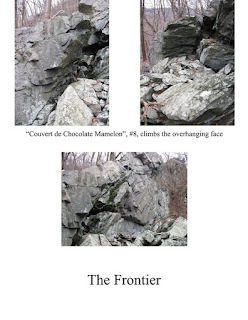 Until I can put up an official website we can use this to post pictures, stories, new routes, old routes, adventures, explorations, whatever you want that pertains to Harpers Ferry Climbing!